We recently spent a vacation in the tropical climate of Costa Rica. Our stay at the Arenal Observatory Lodge provided the best view of the Arenal Volcano. Our room overlooked the volcano, and until the clouds settled in and totally obscured the volcano we didn't realize how fortunate we were to see the volcano in its entirety. Later in our journey, we happened upon some locals that told us they've been to visit the volcano 6 times and have only seen it once. Why didn't I snap more pictures on the day it was in full view! When I asked our guide what is considered a typical drink of Costa Rica, he mentioned Agua Dulce. Costa Rica is known for its coffee, not its tea. Fortunately, we were able to sample Agua Dulce on two different occasions. Sweet Water is the translation, and indeed it is! It is always served hot, made with boiling water and unrefined unbleached whole sugar cane. It looks like brown sugar but smells like molasses. We can imitate the drink by mixing 2 c. boiling water with 3 Tbsp. of the darkest brown sugar available. Stir until the brown sugar is dissolved. Serve with a touch of fresh lemon juice. In San Jose, the capital of Costa Rica, we were served Agua Dulce that also had a frothy topping of milk. Warm and very sweet, the milk added another dimension to this flavorful drink. According to Google, it is a popular campesinos drink, and provided necessary energy for field workers. We recently had the opportunity to enjoy Afternoon Tea at One Steep at a Thyme in Jamesburg, NJ. Owner Kathleen Hippeli describes her tea room as Elegantly Victorian and Graciously Country (tm), and indeed it is. Her beautiful Victorian home offers an invitingly gracious location to enjoy tea. Family and friends gathered around the tea table for a relaxing and memorable experience. The 7-course menu is complemented by a delicious variety of teas. We each selected our preferred tea, some iced, some hot, some herbal, some plain black. The first course featured a choice of their award winning French Onion Soup or a vegetarian Carrot Bisque served with the House Salad which consisted of mixed greens with cranberries, apples, cheddar cheese, pine nuts and vinaigrette. It was a very tasty beginning. The scone course also included a selection of Plain or Cranberry White Chocolate served with cream, jelly, and lemon curd. Kathleen (right) with her Aunt presented the Roasted Vegetable Tart. Delicious! And the tiered tray featured the sandwiches and desserts. The Tea Sandwiches included Traditional Cucumber Sandwich on white bread, a Cranberry Chicken salad on croissant, Campari Tomato with fresh mozzarella salad with balsamic dressing, fresh baked Spanakopita and a Condiment Plate of sweet pickles, pineapple salsa, and chips and cheese. While the top tier included the dessert selection featuring Blueberry Coffee Cake, Chocolate Mint Brownies and Amaretto Cheesecake. It was all very tasty and quite filling. To round out the tea, a seasonal finish of lemon and raspberry sorbet completed the tea. It was definitely a filling array of sweets and savories with a wide variety of flavors. This "By Reservation Only" tea room offered the perfect evening for our special gathering. A special thank you to Kathleen. Very special announcement! The Rosemary House, Sweet Remembrances and Mountainside Supper Club are forming an alliance to offer flavorful prix fix dinners at the tea room. Beginning in March, this delicious adventure will be held on the First Friday of the Month. We are pleased to welcome guest chef Steve Dunlap of Mountainside Supper Club and his culinary talents to Mechanicsburg. He uses locally sourced and organic produce and meats. 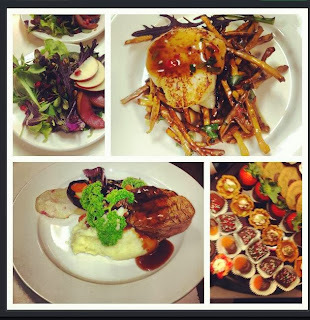 Chef Steve is wonderfully creative with his menus and we are thrilled to be working with his team. The meals range from $24.00 to $32.00 and include salad, soup, entrée and dessert with two seatings at 6 pm and again at 8 pm. There will be four entrée selections, including a vegetarian option. The evening is BYOB. A sample of their work is shown below and an array of menu options is shared to tempt your taste buds. Stoney Creek Valley Farms fresh greens salad with Three Springs Farms apples and pears, cranberries and toasted pumpkin seeds. Seared, dry sea scallop on sweet potato salad, Wife Karen's minis, Warrington farms tenderloin, with mashed turnips and potatoes, with roasted local vegetables. And to top it all off fresh and local parsley! Advance reservations and entrée selection will be requested. Watch for the monthly menus to be posted on our Events page. The merchants in downtown Mechanicsburg are open later in the evening so that you can browse our art galleries and shops. It promises to be a fun evening! Boldly announcing it is a delicious collection of teatime treats, this 'new to me' book was written by Martha Day and published in England in 2012. It also notes it was previously published as The Perfect Afternoon Tea Book. It is a beautiful book, full of gorgeous photography that inspires me to create an afternoon tea! The chapters include savory buns & scones, preserves & spreads, sandwiches, tea breads & cakes, and biscuits, tarts & sweet scones. The measurements for the ingredients are written in imperial and metric measures and standard cup and teaspoon measures. That's a plus! I love a new cookbook, and I'm happy to add this one to my collection. The cheese muffins looks tasty, the sandwich horns look like fun, the lavender cake is certainly something we would serve here. Available on Amazon, I added it to up my order total so I could get free shipping. They know what they are doing! 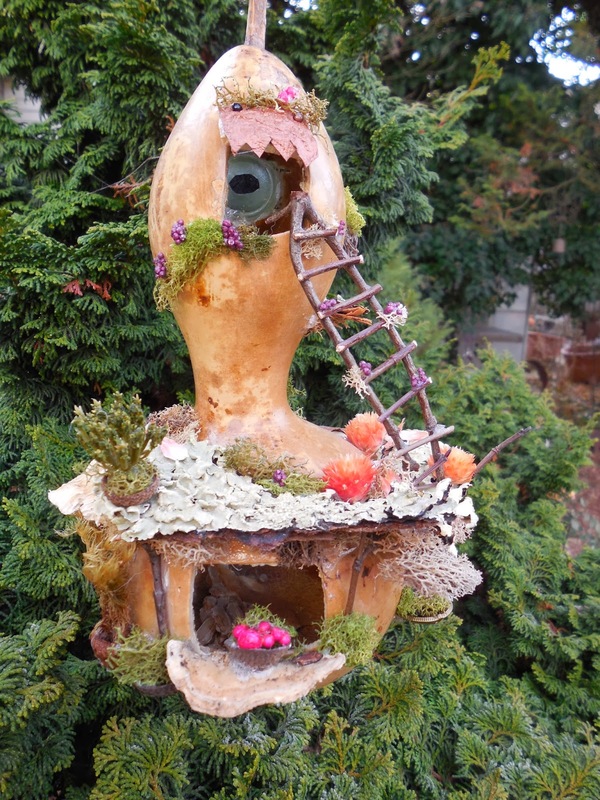 Fairie Kerriwyn will teach us to make these charming fairy gourd houses! Alisa Dupuy will return as Violet Crawley at out Downton Abbey Tea Parties in April! Hats and Bags are a part of our year with Marcella Farina speaking on Women of Hats and Diane Baird addressing Hand Bags. Susanna Reppert will cover Making your own Herbal Medicines Part 1 And Part II as well as the Tastes and Flavors of herbs. In the Spring you can make a Strawberry Jar of Herbs, In the summer a Canning class is being held and in the fall, Fairy House's again -- only this time with Pumpkins. By motorcoach we will travel to the NY Botanic Garden for the orchids and azaleas, to Winterthur for the Downton Abby clothing exhibit and to Cape May for an overnight tour of herb gardens and tea rooms. Just a little peak into our year. Our full schedule of events will be ready by Valentine's Day. And if you ever have an idea for a class or program let us know. This vintage collection of miniature blue willow ware is tucked in a box waiting for its day in the spotlight. Not sure that I have any plans for it, but it should be on display! I love the little casserole dish and the large platter that is with this set, and I'm quite pleased to see that both the tea pot and the creamer still have their lids! Years ago, I won this cute little white teddy bear, and shortly after that, one of my sisters (our parents were blessed with four daughters) gifted this plush comfy chair to me. It is amazing the variety of tea related things out there! She spotted it, and knew I *needed* it, and indeed, my free little teddy now has a spot all his own to lounge about. you'll see the tea connection! are you ready for Downton Abbey tonight? and April 13th. Lady Violet Dowager Countess of Grantham will be joining us for tea! Sharing children's tea sets, this little Toy Tea Set Made in Japan states it is specifically for an 8" doll. Although the forks were tucked inside this old treasure, I'm not sure they originally came with the set as they are quite out of proportion to the teapot and cups. It's a colorful little set simply waiting for an 8" doll to prepare the tea. This whimsical little children's tea set has smiley faces on the petite teacups and also on the sugar and creamer. So cheerful, it should brighten everyone's day that decides to make some pretend tea with this set. Special thanks to Claudette for finding this colorful set, and sharing it with me. It will definitely make an appearance at the Fairy Festival in September! Doesn't it just make you smile!? Last month a gift box arrived from my Pen Pal in Japan. She tucked all sorts of fun treasures and treats into this box. One of the unique items was this box of matcha shortbread cookies that also included two samples of Twinings tea. Not sure what the box is saying, but the shortbread cookies were quite tasty with a nice buttery flavor and a subtle undertone of Matcha. The cookies were individually wrapped, and enjoyed over a period of a few days! My dear friend Grace Lefever, is one of my favorite 'elders'. She doesn't just talk the talk but she walks the walk. In 1955 she began grinding whole wheat flour in her utility room for friends and neighbors. These humble beginnings grew into Sonnewald (Pennsylvania Dutch for “Sunny Forest”) Natural Foods Store. Located on a 60-acre farm in Stoverstown, 8 miles southwest of York, PA. It may be the oldest existing chemical-free farm and natural food store in Pennsylvania. At 91 year old, Grace still inspires me with her intensity, energy and love. She is amazingly knowledgeable (as is her daughter Willa) and wants to share all that she knows. Foster an "attitude of gratitude"
Learn about the acid/alkaline balance of the body. A few practical gifts this past Christmas included this charming package of napkins. Love the fresh and delicate look of spring as it blossoms forth from the cup. Will have to find a very special occasion to utilize these napkins. The other useful gift is this jar opener. They are always handy to have in the drawer, but this one is so pretty I'm not sure I want to keep it hidden away! I love the colorful teacup designs that grace this jar grip. Fun! and indeed practical! Fairies are always good gifts! 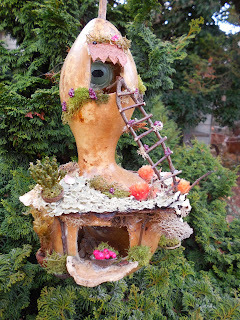 Three other little Christmas gifts, pottery mushrooms and a pretty little fairy for the garden. Bright colors light the mist. This patch looked just the same. Whose pathway do you mark? For all who want to see? And marvel where I sit. New Herbals -Always room for one more book! It wouldn't feel like Christmas if there weren't a new book or two under the tree! The herbals I got this year are The Drunken Botanist by Amy Stewart - This book features the plants that create the worlds greatest drinks. I think most folks know what Corn, Rye, Wheat, and Barley are used in. But have you given much thought to the type of Oak used to make barrels? Or the artisanal potatoes used in whiskeys? Or what drink has Prickly Pear cactus in it (mojitos and margaritas) or have you thought about the walnuts in Nocino. Plus all the other flavoring herbs lavender, jasmine, sweet woodruff, sassafras and many more. This book will quickly become a favorite of mine! My lovely niece thought of me for this gift. Lucky me! Richo Cech's Plant Medicine book was published in 2000, and I am not quite sure what took it so long to come into my possession. This is a tincturer's bible. The book thoroughly covers the mathematics of tincturing and has a dictionary of plants to tincture with exact proportions and suggested dosages. 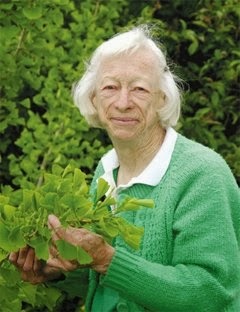 All excellent information from a reliable herbalist. A gift from my Sister Marj, thank you sissy! This Christmas was the year for pottery. Beautiful Pottery! A complete service for 12. Husband David choose the set from our local potter Fitzgerald Pottery. Every piece is so pretty it is such a fun surprise every time I open the cupboard to grab a dish. This lovely hand crafted ceramic tea jar (pronounced tay in Spanish) was another Christmas gift from BIL David. He found this unique souvenir while we were vacationing in Barcelona this past summer, and gingerly transported it back to the States. What a perfect remembrance of our family travels last July. The ceramic piece, Ceramica Artistica Catalana is 'certified and guaranteed that it has been made in Catalonia and that it is hand decorated'. Thank you, David! I love it! Frankincense (Boswellia carterli) is an exudate from the wounded bark of a tree. The milky secretion forms tear drops that are used world wide as an incense. According to the ancient law of Moses, it should be burned in a proportion of six parts frankincense to one part of myrrh. Its pleasant fragrance compliments the musky odor of myrrh. Its presentation to the Child signified recognition of His divinity. Myrrh (Conniphera myrrha) is a dark resin that exudes from the bark of a small tree of East Africa and Asia. This forms "tears" which are used in perfumes, as incense, and as a healing agent for embalming purposes. In ancient times it was valued more than gold. As a gift to the Christ Child, it signified his mortality. My newest tea treasure is this beautiful hand crafted porcelain teapot by the local artists at Fitzgerald Pottery in Dillsburg, PA. Brother-in-Law David gifted this to me on Christmas morning. It's such a stylish and unique addition to the collection. Notice the clever little tab that holds the lid in place as you pour the tea. Very nice! Thank you David, for such a thoughtful gift. It pleases me to be the recipient of a Shop Local, Shop Small Business gift! We had a full year of classes, bus tours, luncheons, teas, and special events. This is just a sampling of some of the activities we held in 2013. Planning is already taking place for another packed year of events in 2014. Thank you so much for your continued support of all our events. Super Scone Sunday is our special winter event that we offer in January, February and March. The hustle and bustle of the holiday season is behind you, and the chance to sit and enjoy oven fresh scones and tea is a good way to start the year. We are always happy to welcome authors to the tea room. In March, Kim Hendrickson, author of Savory Bites and Dessert Canapés joined us. In the summer, Rosemary Harris the author of The Dirty Business Mystery presented a program for us. In April we paid tribute to Downton Abbey with a special event featuring 'Tea with the Parlor Maid'. Watch for the Dowager Countess to visit Sweet Remembrances in 2014! Mother's Day is always a very special event in the tea room. Shown here are the sandwich plates ready and waiting to be served to our guests. Traveling Herb Seminars take us to many different gardens and tea rooms in the area. In 2013 we traveled to the gardens of York and Lancaster counties. We also journeyed to Washington, D.C., and later to Maryland. Watch for details about our traveling herb seminars in 2014, including a trip to Cape May. In July, first person historical interpreter Alyssa Dupuy introduced us to Clara Barton. Later in the year, she presented an entertaining holiday program as Queen Victoria. In August, family and friends journeyed to Spain in celebration of Nancy's 60th. What a memorable experience in a majestic country! For the love of Shoes! was presented in August. These darling cupcake shoes hold the record for being the most photographed dessert in the tea room ever! 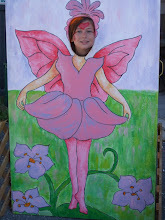 Our Fairy Festival continues to delight young and old. Mark your calendars, the 2014 festival will be held on Sept. 6th and 7th! Our annual Halloween Teas are very popular, so popular that we will schedule three in the coming year! We like to have fun with this one! The holiday season begins on the Friday after Thanksgiving and continues through the month of December. Holiday teas, special events, craft classes and private parties along with extended hours in The Rosemary House keep us all busy. What a fun and memorable year we had! We're excited to welcome the New Year and another season of special events, traveling herb seminars, afternoon teas, and more! We hope to see you in the gift shop and in the tea room soon!